Find My Workspace lists over 95% of the business centres market in Cobham. Simply click Request Quote to check pricing for one office, or Add to Basket for multiple offices. This centre is a large coworking space that also offers private space in Cobham, Surrey. With over 100 desks in total and four different membership options; Pay as you go, virtual, dedicated desk and private office space there is something for everyone. The permanent desks spread across three open-plan floors, two of which have pods of four desks and are available for teams from 1 – 20 people. The private office options allow members to take on private, partitioned space in teams ranging in size from 3 – 30 people. The building itself is a high-spec space with meeting rooms, a lounge/cafe area, tea points on all three floors, quiet ‘telephone’ style boxes, an on-site management team, shuttle bus service, on-site parking, changing room and shower facilities, social/business events and postal services. This is one of the only spaces of it’s kind in the area, building a fantastic coworking environment, synonymous with community atmosphere that can be found in similar workspaces across London. Based in Cobham, this newly refurbished centre provides a great platform for any business to flourish with its cost effective workplace solutions. The centre is non-branded which allows any potential tenants to customise the space to align with their brand. Similarly, interior design is neutral allowing for further opportunities to make the space your own. The space is also accessible 24 hours a day, allowing tenants to build their own working schedule. 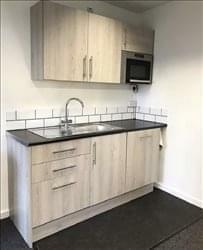 Other amenities include fast WiFi, keypad telecom entry, cleaning of communal areas, fully equipped kitchen facilities, dedicated breakout space and flexible terms.